Leah and Gee Aldridge spent a decade planning and collecting for their custom beach house on Kiawah Island. The interiors are peppered with meaningful mementos, such as the painting by artist Eric Zener that the couple found in a Boston gallery and now hangs over the banquette. 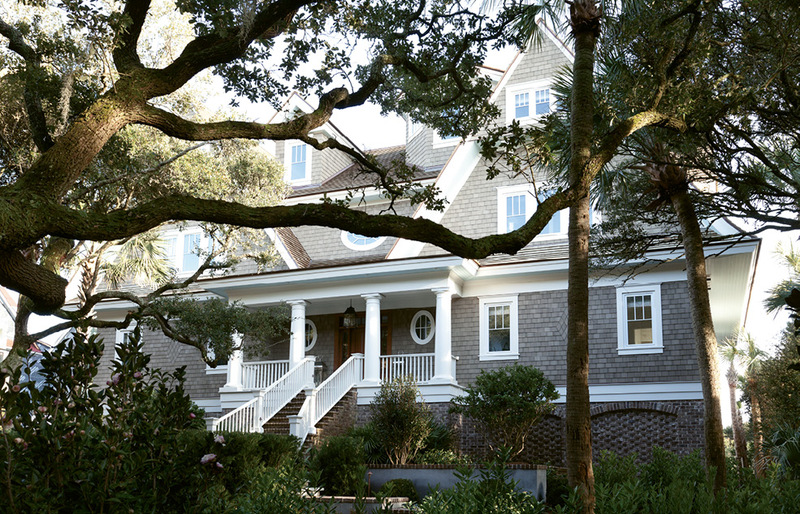 The front entrance to the shingle-style abode is shaded by old-growth oaks. The rear overlooks sand and shore. A painting by Colombian-American artist America Martin presides over the hearth. While traveling in Spain, Leah and Gee fell for this large-scale Jorge Gay portrait of fishermen at work. 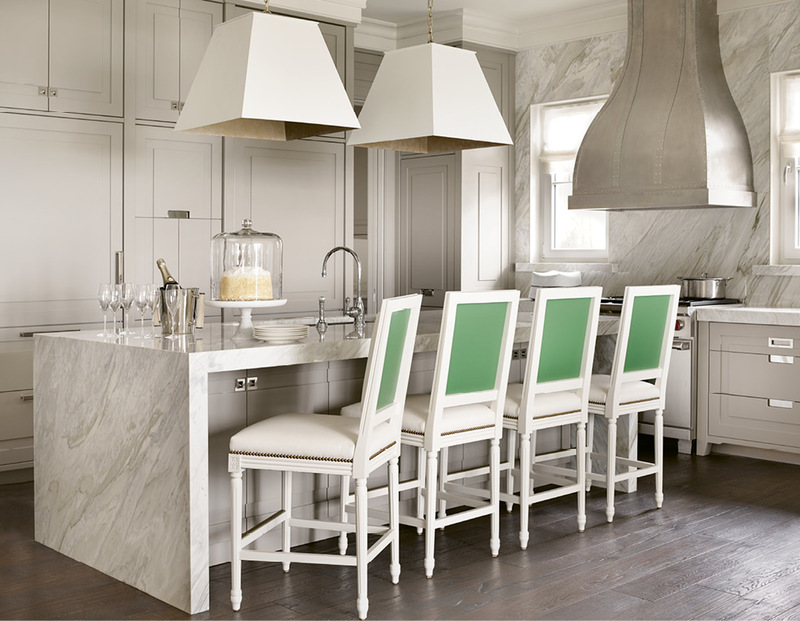 The kitchen sets a luxe tone with its walls and waterfall island wrapped in Calacatta Gold Extra marble as well as brass-lined light fixtures by Avrett, while custom chairs outfitted with white vinyl and green leather add graphic punch. 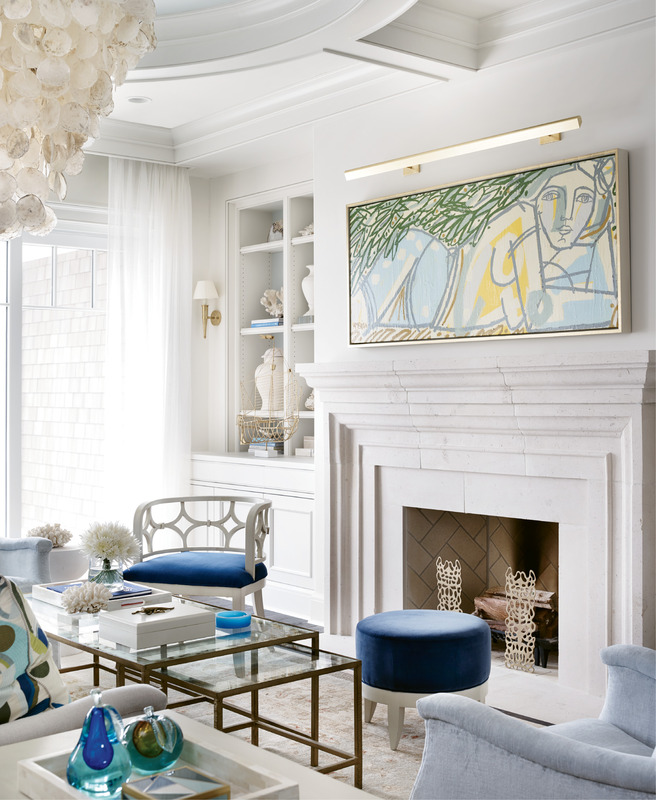 Though the decor isn’t overwhelmingly “beachy,” there are nods to the coastal setting, like the piece of driftwood from Bali hung over a Bradley USA concrete console table and a capiz shell chandelier by Oly. This columned porch provides both privacy and panoramic views. “The curved porches and their roofs shield the house from the neighbors, so you feel like you’re in the only house on the beach,” says architect Chris Rose. 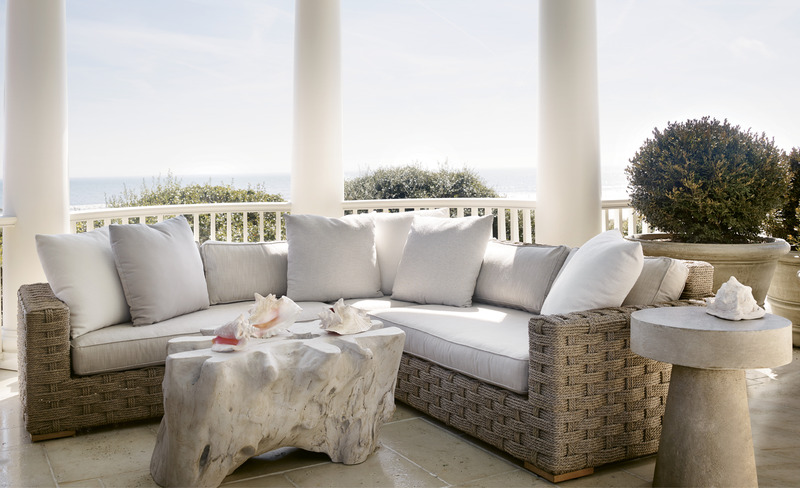 The outdoor furnishings, including a Restoration Hardware rope sectional, were selected to echo the classicism and Cape Cod influence of the architecture. 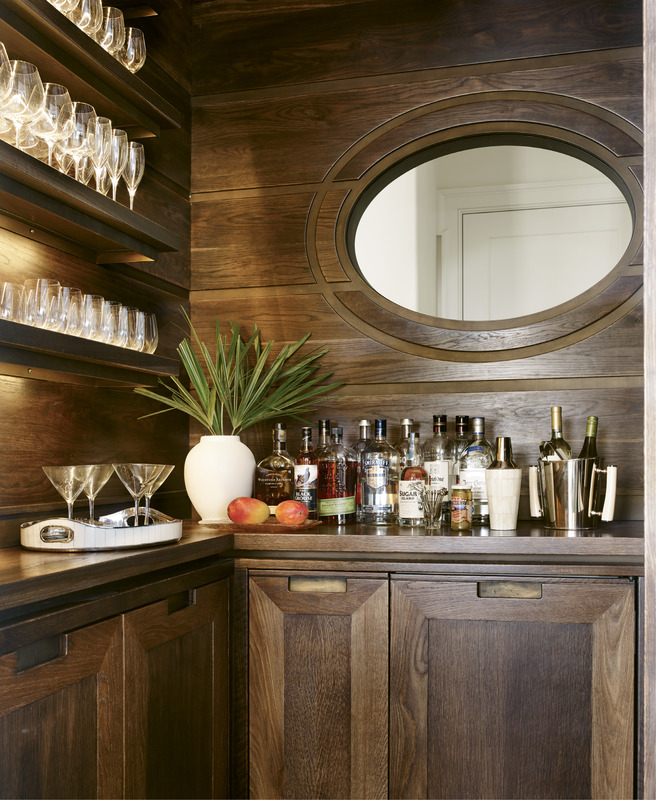 Custom cypress cabinetry by local firm ECR Joinery and an oval-shaped interior window distinguish the bar, which separates the kitchen and living room. The driveway wends through a maritime forest of wind-swept oaks and under the guest cottage, which includes a kitchenette. 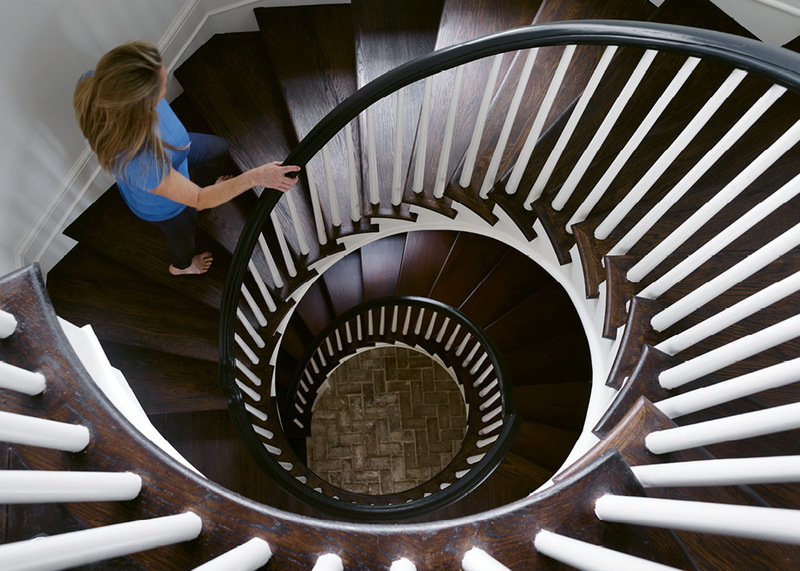 In the main residence, a circular staircase rises three stories to the family’s private quarters. In the master bedroom, walls covered in Farrow and Ball’s “Mole’s Breath” and drapes made with light grey Shumacher fabric ground the room’s blush accents. The lamps are from Circa Lighting. 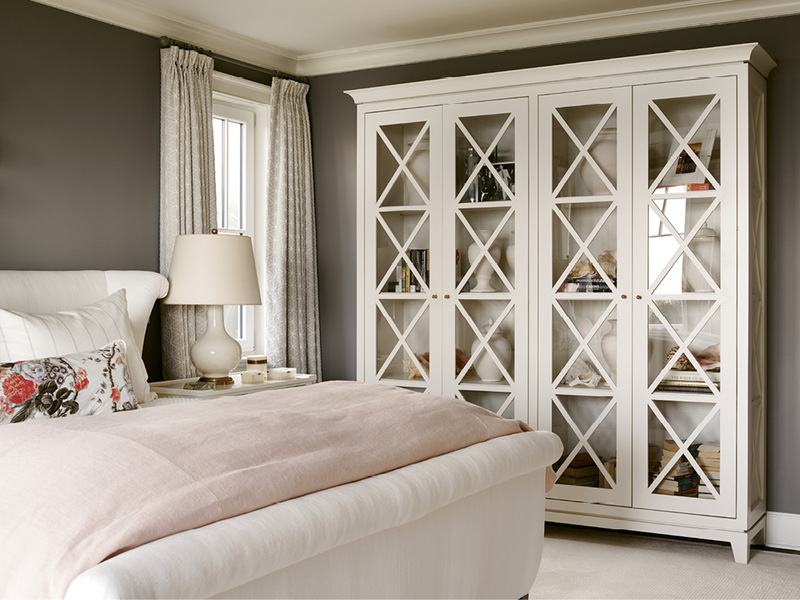 The custom bookcase holds mementoes, such as the conch shells Leah’s skin-diving husband has been pulling up for her since their honeymoon. 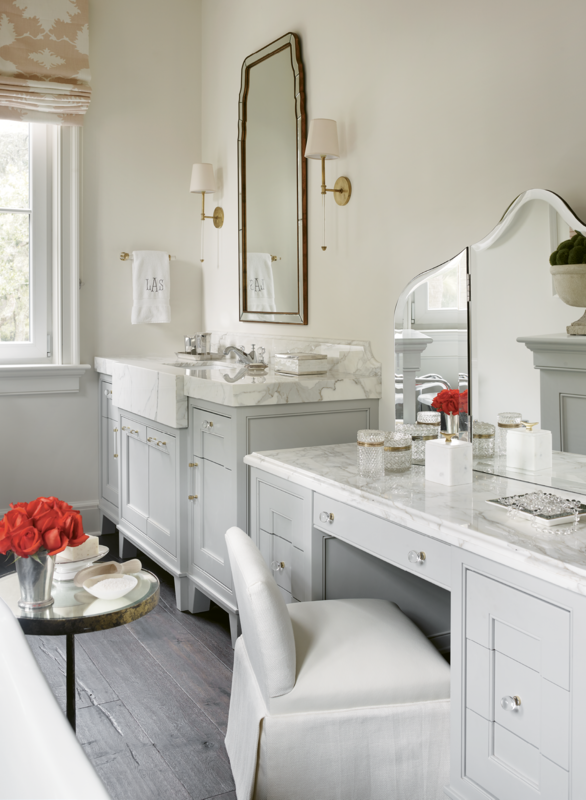 The suite is outfitted with his-and-her baths; Leah’s includes a dressing table complete with a custom vanity stool. The bunk room’s cool comforts include the slate grey walls, shag Moroccan carpet, and pops of lime green. Another guest room offers a soothing blue palette echoed in the upholstered headboard. PHOTO: The front entrance to the shingle-style abode is shaded by old-growth oaks. For Leah and Gee Aldridge, time spent at their Kiawah Island vacation home is a blur of salt-and sun-soaked activity. Over the course of a single afternoon, they might pilot paddleboards, surfboards, and bicycles, while their three teenage children keep busy riding horses, sailing, and shooting hoops ay nearby Night Heron Park. Back in Atlanta, the couple’s schedules are packed: they’re both attorneys, and Leah, a burgeoning politician, is running for state senate. Here, the pace is no less bustling, though the items on the agenda are purely for fun. Even Daisy, the family’s black Lab, gets in on the action, running up and down the beach and splashing into the ocean. When they’re not in motion, the family finds respite in their posh beachfront abode. 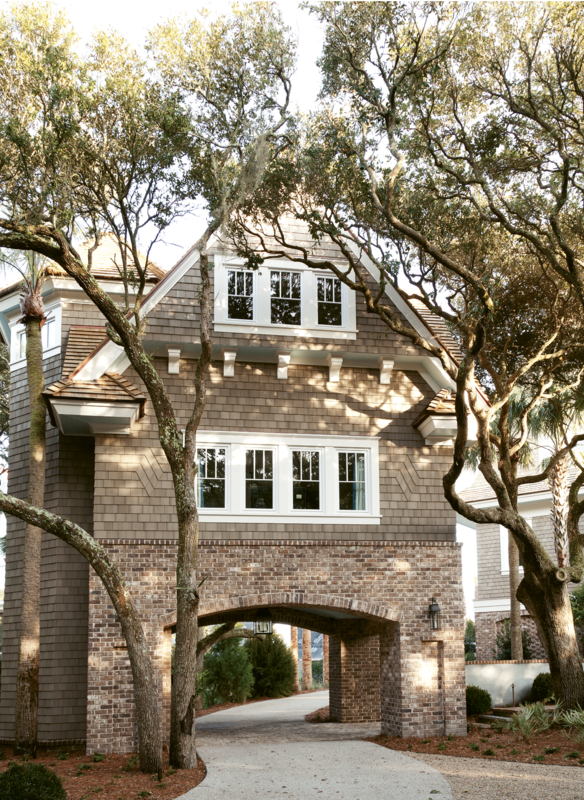 Situated between shoreline and maritime forest, the nearly 6,500-square-foot shingle-style structure is hemmed in by a canopy of centuries-old oaks on one side and a stretch of sand on the other. The sophisticated interiors create a luxe oasis where French linen sheers flutter in the breeze, pedigreed antiques mingle with contemporary pieces, and a spiral staircase rises three stories to the family’s private quarters. Beautiful custom architectural details, such as an embellished ceiling in the living room and cypress wet bar off the living room, create further visual interest throughout. Given their considered approach, it’s no surprise that the couple spent a decade searching for their ideal second home, collecting the pieces that would furnish it along the way. During those years of house-hunting, the Aldridges often vacationed on Kiawah. “We stayed on the marsh, river, and ocean before deciding where we wanted to purchase; they all held a different allure,” Leah says. “We know what it’s like to play in the mud on the marsh, take a boat right off the dock on the river side, and watch the birds trail the shrimp boats out on the ocean,” she notes. But the latter won out: “There’s nothing like the beach at Kiawah,” Leah concludes. Their patience paid off, as Leah and Gee eventually scored an oceanfront property on an oak-lined street, which was originally developed in the mid-1950s. The site was just right—“I can open up the windows and hear the ocean,” Leah says—but the house situated on it was not; the couple decided to level it and start fresh. 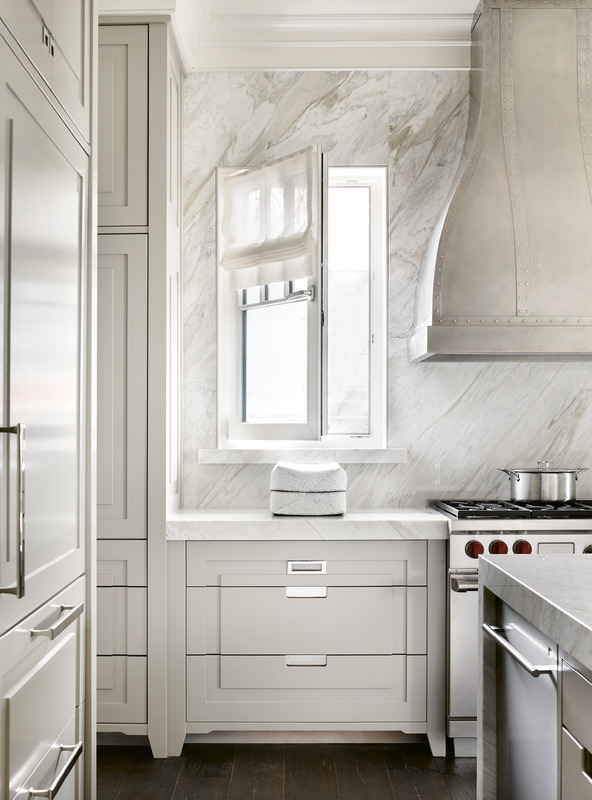 They tasked area architect Chris Rose and Atlanta-based interior designer Melanie Turner with conjuring a new home-away-from-home specifically tailored to their needs. Builder Nolan V. Sires completed the team. “We care a lot about honoring tradition, and we wanted to respect the architectural traditions of the island,” Leah notes. With this in mind, Rose designed a 5,700-square-foot shingle-style residence, plus a 770-square-foot guest cottage. “The shingle style is a truly unique American style of architecture,” Rose notes. The iconic look, which has roots in 19th-century New England, visually connects the house with a number of the island’s prominent buildings. Though the aesthetic is traditional, Rose points out that some of the building materials are modern: “The shingles look like true Western cedar, but they’re PVC, which holds up better in our salty, hot, and humid environment,” he says. “The exterior trim is PVC as well, so it will maintain its crisp appearance.” In contrast, the roof’s copper detailing will patina to a soft verdigris finish over time. Throughout the design process, scale was an important consideration. “I’m not partial to spaces that feel cavernous,” Leah says. “I wanted a house that was human-sized and harmonious, where every space had purpose.” The couple tasked Turner with mapping out a floor plan that fostered connection despite the home’s generous square footage. That meant separating the living room, dining room, and kitchen so that each zone functions more intentionally. “That decision made for more intimate gathering spaces,” Turner says. To that end, Leah and Gee often enjoy dinner for two at the petite banquette in the living room. On other evenings, twin dining tables from Bradley USA are enlisted to accommodate the family of five or a larger group, such as the Aldridge family reunion the couple hosted last Thanksgiving. Six bedrooms plus a bunk room in the main house and the two-bedroom guest cottage mean that overnight guests are always welcome. With the right proportions established, Turner began crafting interiors that felt casual and relaxed, but also traditional and tailored. 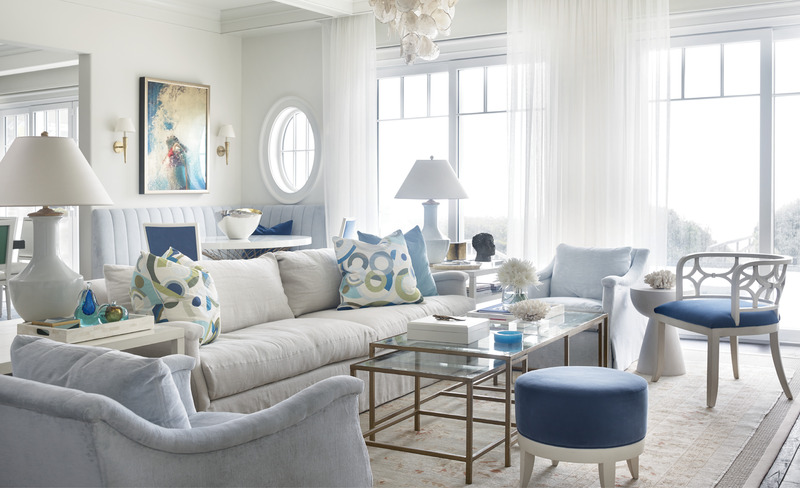 While the home isn’t overtly “beachy,” it’s certainly friendly to life at the beach. “They wanted fabrics they could sit on with wet bathing suits,” Turner says. Case in point: custom dining chairs made with white vinyl from Castel look refined, but hold up beautifully to post-swim wear-and-tear, as do faux-leather seats on the banquette. The home’s first-floor color palette was derived from a floor-to-ceiling painting by muralist Jorge Gay. The Aldridges purchased the work, which now hangs in the dining room, while traveling in Spain, and Turner riffed on its blue and green tones with pieces such as light blue Lee Industries club chairs, custom green leather-backed dining chairs, and deep blue Hickory Chair banquette chairs. Turner helped with sourcing other meaningful pieces, including vintage posters from the Fort Lauderdale Society that depict spring break the year Leah’s parents met on those very beaches. Many of the antiques, like the gueridon foyer table from Jacques Antiques, were sourced locally, and custom iron light fixtures by area maker Avrett nod to the city’s history of celebrated metalwork. “Leah and Gee felt very strongly about purchasing items from local artists and purveyors, because they wanted to invest in the city of Charleston itself and its artisans,” Turner explains.